I swear I had no idea one of our favorite Huntsville chefs, Chef James Boyce, had opened up a restaurant in Birmingham! But of course, when I found out, you know I had to pay a visit. The opportunity presented itself, recently, when I drove my mom and dad to a doctor's visit. Galley and Garden is located on Highland Avenue in the stately columned home that used to be Veranda on Highland. Having eaten at both of Boyce's Huntsville restaurants, Cotton Row and Commerce Kitchen, I knew I was in for some delicious food. I was not disappointed. The interior of the restaurant is light and airy, elegant and understated. We were seated in a small room with a large window overlooking the back of Chef Chris Hastings' Hot and Hot Fish Club. This neighborhood is home to some of Alabama's best restaurants. Chef Frank Stitt has two restaurants, Highland's Bar and Grill and Chez Fon Fon, in the same area. Our server brought out water and menus. The selections included starters and salads, flatbreads and entrees. First things first! We quickly decided that the duck confit fries warranted further investigation. I didn't really know what to expect, but we were all really happy with what we got. The handcut fries, were fried in duck fat and piled on top of thinly cut slices of actual duck. Then the whole thing got covered in a gorgonzola bechamel sauce. It was about as decadent as it gets and delicious to boot. We couldn't believe how good it was. The fries were so yummy coated in that cheesy sauce, but the real surprise? The duck was incredible. I didn't realize I could like duck so much! 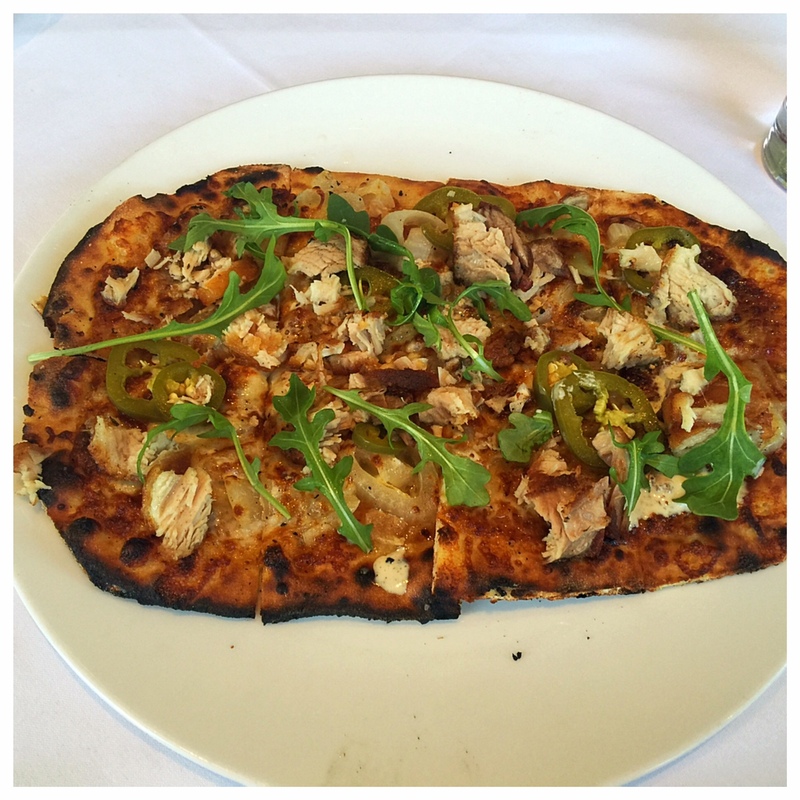 Oddly, mom, dad and I all chose a flatbread for our entrees. There were three flatbreads on the menu and we each got a different one. Daddy went vegetarian and chose the wild mushroom flatbread with caramelized onions, arugula and grana padano. Mom got the chicken flatbread with pesto, pecorino romano and oven roasted tomatoes. I thought her flatbread was really pretty with the red tomatoes peeking through the melted cheese. I couldn't resist the pork belly flatbread with tomato chutney, pickled jalapeños and white barbecue sauce. Pork belly is my new obsession. If it is on the menu, I feel I owe it to myself to check it out. And white sauce? Well, what self-respecting Alabamian can pass on the state sauce! The jalapeños gave the rustic pie a spicy kick. Which flatbread was best? Hard to say because we were all really happy with our choices and each of us thought our selection was the best. At the end of our meal, a drink server accidentally brought coffee and hot chocolate to our table. We thought it was a little bonus and my mom had knocked back her entire cup of hot chocolate before it dawned on us that we had actually gotten another table's order. Mom said that hot chocolate was divine! I wouldn't know. She didn't share! Now that I have tried out the lunch menu, I definitely plan to make a return visit to flight test the dinner menu. I can only imagine the treats Chef Boyce has in store for the evening meal. 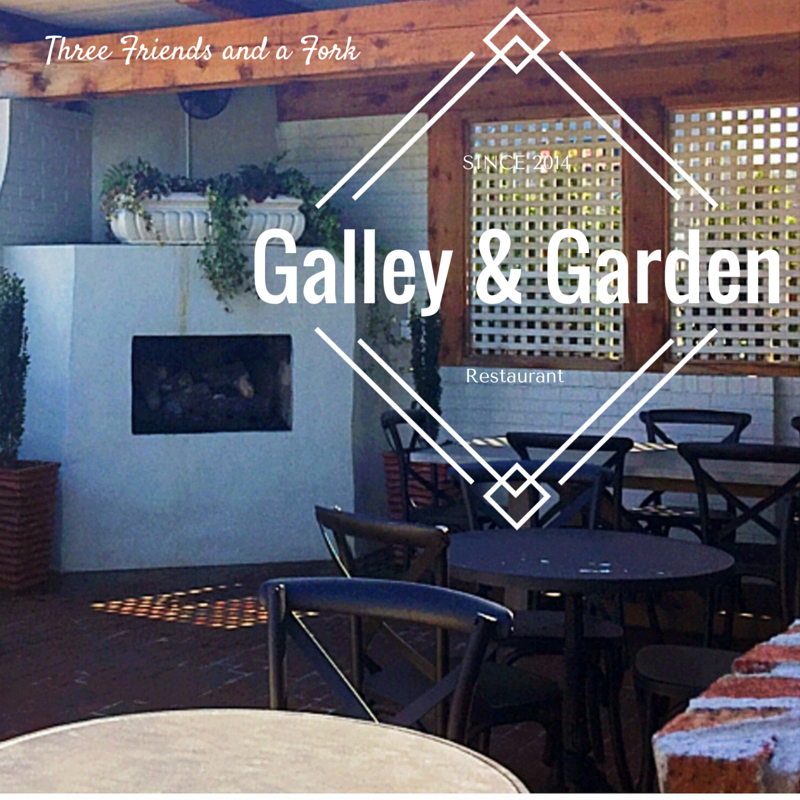 Three Friends and a Fork give Galley and Garden and Chef James Boyce 3 Enthusiastic Yums UP!